granted, he's been there 12yrs and they haven't been back to the dance since his 2nd year, but that's something you just don't see in san marcos. Something's got to be up. I can't imagine it's performance based. I mean how'd he get through the first 9 seasons? Their last 3 are easily the most successful I recall in my time following Southland/Sun Belt basketball. Since I have not been able to respond to everyone that has reached out, I decided to write a statement about the events of today! Two things that I believe & will continue to do: #TakeTheStairs & #TrustTheGoodLord! This action by UTA does not make a lot of sense. Odds are, their next hire won't be as good as the guy they just shoved out the door. Cross is a class act. 72 wins in the past 3 seasons, outstanding. He didn't deserve to be treated this way by a University he'd given so much to. Hope that he lands on his feet. Bobcat Athletics: Crushing the Hopes and Dreams of Die Hard Fans Since 1899. By literally all accounts the decision was performance based. Which is absolutely head-scratching given the success that program has had over the last 3 seasons. Apparently the expectation was NCAA tournament or else. I've yet to see a single person support this firing. Whether connected with UTA or not. Their "NCAA or else" performance measure is questionable, given that the SBC is a single-bid conference and the bid goes to the tournament winner with no consideration of regular season success. UTA has consistently been in the top 3 of the conference. It isn't like UTA is a resource-rich institution with a highly engaged student body regarding athletics. I'll bet Cross has passed on other opportunities out of loyalty to his program. He just became a cautionary tale for whoever they pick-up to replace him. Can we hire him? I wouldn't mind having 72 wins over 3 seasons. not going to lie, that was my immediate thought as well. Word is they want to hire Chris Ogden, from Chris Beard's staff at TTU. 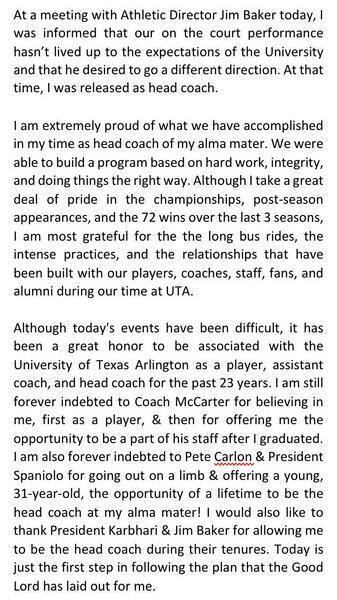 Ogden is a hell of a coach and great recruiter, but it'll be difficult to match Cross' wins at UTA. I would love for the Bobcat's to have a coach like Scott Cross, or at least one who could make us above average. never understood the love for chris ogden, probably because i thought barnes was a terrible coach. also maybe because he has the personality of drying paint and looks like an insurance salesman. He was fired due to missing the NCAA tournament the last two years with what many regard the best talent they've ever had with Hervey and with Erick Neil last year. The AD and the President want to show their asses as they both arrived after Cross and he was highly regarded since he is an UTA alum. They also want the guy from Texas Tech. I can tell you that few at UTA are happy with this decision. They will loose some of the little Alumni support they had since everybody is pissed off at this move. Attendance is half assed anyway. I don't see much of a difference there unless they really succeed. Looks like Chris Ogden it is. "I get why everybody is upset," Ogden said. "There is nobody that has more respect for Scott Cross than I do." Ummm... given timing, I'm pretty confident Ogden or his agent was having discussions with UTA people prior to Cross departing. Baker acknowledged the need for a "full-court press" on everything from fundraising and sponsorship to boosting attendance. And he said that Ogden will need "a couple of years" to rebuild. Really? UTA is a consistent winner. I know they are losing eight seniors, but that is a program with a winning tradition that does not require substantial rebuild or cultural surgery even when losing a number of players. UTA seems highly defensive of these moves. I'm not impressed with Ogden, despite endorsements. UTA is talking routine NCAA appearances, fundraising, sponsors & increasing attendance, and Ogden isn't exactly an engaging individual. I don't see any background that would make me think he has skills in those areas. WOW. GREAT move by dixon. i really didn't think he'd do so well, and especially so quickly. adding cross is really going to help cement that team at the top of the conf for the foreseeable future.